Garden Arbors and roofed Arches. We make a wide range of garden arbors to suit all our customers needs. 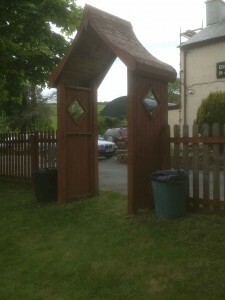 This is an Arch that was designed for the entrance to a beer garden of a pub. It is made with solid roof and solid sides. This can be made for an opening of up to 5′ wide and can even be fitted with a gate if required. It is made with a Japanese looking roof that makes it stand out. This Garden Arbor has a gate fitted and is part of a fence dividing a garden.All the timber used in our garden arbors is pressure treated. The posts are designed to be dug into the ground and concreted in so they will not blow over. Our Japanese roof on this arch is made with T G V timber sheeting and forms part of the curve of the roof.The sides are normally made with trellis batons with a 4″ space and can also be closer spaced at 2″ .But can also have solid sides. 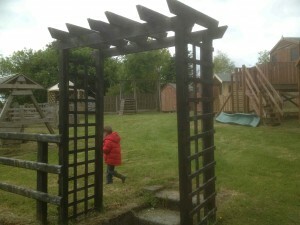 A garden arbor or arch is a great way of dividing a garden along with a fence low or high it does not matter. The arbor will always look well and be a center piece for your garden. If you want to call to our Display Yard you will get a better idea of what you want and size .Or you can ring us for more information on 0402 34703 / 34986 . 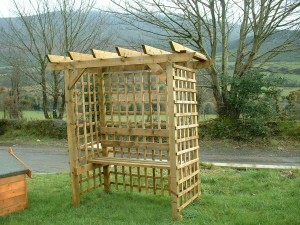 We also make Pergola Arch Seats. This is the Pergola seat. It is 5′ long and 3′ deep and 6′ 6″ high. It is ideal for 2 people to sit in it with comfort. It can be made to sit on a patio or deck or with long posts to go in the ground. 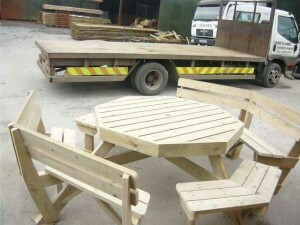 Made with pressure treated timber it is a simple structure that will look well in any garden. This seat is €230 incl vat. Fitting can also be arranged.